Seventh-grade teacher Diane Anderson started a skiing and snowboarding club at Franklin Middle School in 2009, at the urging of a former principal who wanted to reward students for good behavior, grades and attendance. Apparently, there are a lot of good kids at the Pocatello middle school, and Peck chose the right activity to appeal to his student body. 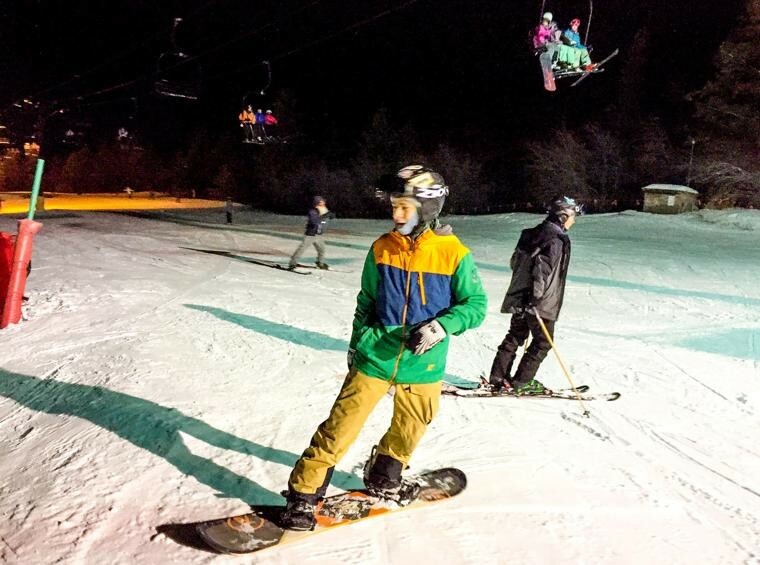 When the Franklin Snow Club made its first field trip of the year to go night skiing and snowboarding at Pebble Creek Ski Area in Inkom on Jan. 11, it took four buses to transport the roughly 140 children. Anderson said the club, which started with 30 to 40 members, now boasts 225 participants. The club makes four Friday night field trips throughout the season and one trip for all-day skiing and snowboarding during a school records day, when classes aren’t in session. Dana Crist, winter sports school programs director at Pebble Creek, said William Thomas Middle School in American Falls and Firth Middle School also have long-established ski clubs, and Highland High School has a new ski club. In addition to the clubs, Pebble Creek hosts local schools that take field trips during school days after Christmas break. “We have schools basically five days a week from then into mid-March,” Crist said, adding that all Pocatello-Chubbuck School District 25 middle schools participate in field trips at Pebble Creek. Pebble Creek offers students a discounted rate for lift tickets and rentals. Lessons are also offered for Franklin Snow Club members. Ann Swanson said her son Kevin joined the Franklin club after some of his friends signed up. This is his first season of skiing, and Swanson, who isn’t an avid skier, said the lessons have been invaluable. Classmates Eo’in O’Doherty and Jacob Shroll are both accomplished at winter sports and have season passes to Pebble Creek. But they also look forward to the camaraderie of participating in the club — even though only the beginner lift runs at night. Shroll appreciates the ride, providing him bonus skiing time, and he’s seen friends improve significantly after they complete lessons. “I’ve met a lot more who ski doing the ski club,” Shroll said. Other Franklin teachers have helped Anderson as chaperones. She’s required to have one teacher per bus. Anderson believes the students benefit from the opportunity to participate in an activity away from school and independent of their parents. She says many students discover a love for a lifetime sport through the club. Most importantly, she said the club motivates students to come to class, study a bit harder and maintain a positive attitude. Franklin excludes students from club events if they misbehave, skip classes or don’t achieve passing grades. “I think it does kind of get them to toe the line a little bit,” Anderson said. Franklin club members pay a fee at the start of the program covering transportation, the cost of a club T-shirt and skiing or snowboarding expenses. Anderson said the club uses any extra funds to buy hot chocolate or other treats for the group during ski trips, or to cover expenses for students who couldn’t otherwise afford to participate.